Come enjoy a fun family friendly car show event and help support your next generation of Hot Rodders. We donate a portion of the event proceeds to Sioux City community school shop classes! * 8am Morning Cruise. Meet at The Ickey Nickel. The cruise route to be determined and back to car show. *2:00 Cookie Contest so if you think you can spin circles in your ride than this event is for you. How to Sign Up for Volleyball! - Sign-up sheets can be picked up at the Ickey Nickel. - Brackets will be made on a first come first serve basis & nights will fill quickly. - All members of the team must be listed on the sign-up sheet with their age and signature. - Must be 18 years of age or older to play. - League is played Monday through Friday. - Games will be played at 6:30, 7:30, 8:30, and 9:30p.m. - On Tuesday night, Division A is the "power league" division. This is the most competitive division of play and is meant for skilled volleyball players only. - Tuesday night divisions B, C, and D are the same level of difficulty as every other night. - The beginning of the season is considered "pool play." - Your results in pool play will be recorded and will determine your seed in the final tournament at the end of the year. - Tournament details will be released in July. Friday Night All You Can Eat! Delicious Spaghetti served with a side salad and breadstick. Add $2 more for All You Can Eat! Also... THE SUN IS BACK! Come enjoy it on our patio! 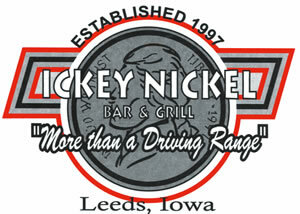 Nickel Bike Nights @ Ickey Nickel! Nickel Bike Nights - Every Tuesday (starting June 27th) 6pm - 10pm! Come in on your bike and you'll have Twofer specials along with Cheap Burgers and Brats at Peso's Bar on the dance floor!